"What is nobler than to mold the character of the young? I consider that he who knows how to form the youthful mind is truly greater than all painters, sculptors and all others of that sort" (St. John Chrysostom). 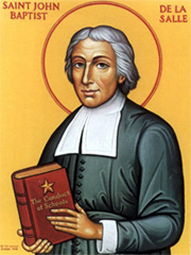 Complete dedication to what he saw as God's will for him dominated the life of John Baptist de la Salle. In 1950, Pope Pius XII named him patron of schoolteachers for his efforts in upgrading school instruction. As a young 17th-century Frenchman, John had everything going for him: scholarly bent, good looks, noble family background, money, refined upbringing. At the early age of 11, he received the tonsure and started preparation for the priesthood, to which he was ordained at 27. He seemed assured then of a life of dignified ease and a high position in the Church. The remainder of his life was closely entwined with the community of religious men he founded, the Brothers of the Christian School (Christian Brothers, or De La Salle Brothers). This community grew rapidly and was successful in educating boys of poor families, using methods designed by John. It prepare teachers in the first training college for teachers and also set up homes and schools for young delinquents of wealthy families. The motivating element in all these endeavors was the desire to become a good Christian. Yet even in his success, John did not escape experiencing many trials: heartrending disappointment and defections among his disciples, bitter opposition from the secular schoolmasters who resented his new and fruitful methods, and persistent opposition from the Jansenists of his time, whose moral rigidity and pessimism abut the human condition John resisted vehemently all his life.